Rumors of Zomby's October 1 show in New York City sprung up months ago, with little information to be found other than the possibility that the show was happening. With plenty of buzz existing surrounding his 2011 album Dedication (on 4AD), people were excited, but no one was quite sure what to think, given his reclusive nature and the unlikelihood of a U.S. appearance. The rumor gained increasing credibility when a venue, Glasslands Gallery, in Brooklyn, was mentioned, and then an RSVP page appeared, informing RSVPers that they would soon be emailed with a link to tickets available for just 48 hours. Tickets were just $12, but they took vigilance to acquire. The show sold out fast, to be expected given Zomby's reputation and the tiny venue. It was a neat experience being a part of a crowd that definitely wanted to be there — it's hard to imagine anyone ending up at this show by coincidence, and while the crowd could have stood to be a bit less stoic during the openers, I guess some people needed time to liquor up. First openers JDH & Dave P warmed the crowd up with a well-suited set of IDM tunes, including some welcome Gui Boratto tracks. After they played, a band took the stage. Wait, a band? A band. I was skeptical of the idea of a band playing in between a solid IDM set and Zomby himself, but True Womanhood were a fitting choice, playing a set of mostly originals peppered with quirkily modified covers of both Pictureplane's "Dark Rift" and Justin Timberlake's "My Love" (um, can you guys all marry me? Thanks). Their sound was a neat shoegazey, post-punky one that I could definitely appreciate and that suited the mood, and they seemed ready to have fun, too. Look around Earmilk for a post about them (with music) soon! The crowd waited with bated breath for Zomby's set to begin, still not entirely sure that he would show up at all. He did show up, taking the stage in a Guy Fawkes mask and playing a really great set for about an hour. I wasn't completely sure what to expect, since Dedication, his latest, was more on the experimental or ambient side than the dancey side, but his set was more reminiscent of his 2008 album, Where Were U In '92, with plenty of hip hop flair. This was the old school, grimey dubstep sound at its finest, a state that's a rare sight in the U.S. and was a delight to be able to dance to, even for just an hour (last time I saw a set this grimily awesome was at Mary Anne Hobbs' Boston show this past spring). 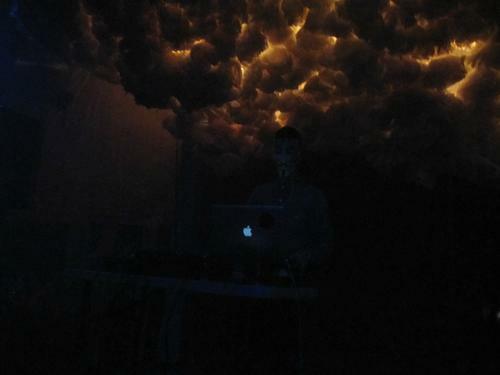 If you get the chance to see Zomby, especially in such an intimate venue, do it! There's not much else to say, other than that Zomby fulfilled my expectations and proved his capabilities as both a producer and a DJ, and as someone who knows how to treat the two as separate but intertwined entities. His mixing may not have quite been at the same level as his production, but it was still a very enjoyable set that proved the man knows the difference between dance music that people want to hear in a show setting and music that's better to sit and listen to at home. To be honest, I can't remember many of the specifics of what he played, not because there weren't glimmers of familiarity or because I was MAD CRAZY DRUNK (I wasn't) but because that is a weak point for me at electronic shows in general, especially with artists who I listen to more as an album than as singles (like Zomby). I'm including tracks that remind me of the tone of the show, but they may or may not have actually happened. Feel free to fill in the blanks in comments if you also attended the show!